Told as if to an ethnographer, the story of Goona Goona transforms an ostensible Balinese legend into a melodrama enacted by locals and filmed by foreigners André Roosevelt and his son-in-law Armand Denis. Life is peaceful in this seaside kingdom until a prince returns from studying abroad and turns his unbidden attention to an unattainable lower-caste girl betrothed to another. Intrigue and romance are but excuses however for what is essentially a showcase of the island’s natural beauty and its people’s ancient culture of farming, fishing, ritual, and dance seen through Western eyes. A 1930s hotspot for affluent tourists Bali hosted a series of artists and adventurers that included painters, photographers, ethnographers, filmmakers, movie stars, writers, and scions of the wealthy, who returned home with their own romanticized versions of Balinese life. Roosevelt and Denis’s gorgeously photographed film launched an avalanche of imitators released in American art houses as “Goona Goona” films. Musicians from the Balinese-style ensemble Gamelan Sekar Jaya join with members of Club Foot Orchestra to accompany Goona-Goona. Founded in San Francisco in 1979, Gamelan Sekar Jaya has been called “the finest Balinese gamelan outside of Indonesia” by the Jakarta-based Tempo Magazine. 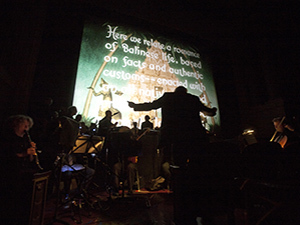 Club Foot Orchestra, also native to the Bay Area, has composed and performed for silent films since the 1980s. Sekar Jaya players include I Nyoman Windha (gamelan, voice), I Dewa Berata (gamelan, voice), Marianna Cherry (gamelan), Carla Fabrizio (gamelan, cello), Samuel Wantman (gamelan), and Sarah Willner (gamelan, viola). Club Foot Orchestra members are: Alisa Rose (violin), Beth Custer (clarinet), Chris Grady (trumpet), and Richard Marriott (winds). Richard Marriott conducts his original score. One of Bali’s most eminent musicians, I Nyoman Windha, is widely regarded as Bali’s greatest living composer and is the recipient of numerous international awards. He is currently serving, through June 2019, as the Guest Music Director for the Bay Area’s renowned Gamelan Sekar Jaya. This year Sekar Jaya is celebrating its 40th anniversary and Pak Windha will lead the ensemble in anniversary celebration concerts at Fort Mason’s Cowell Theatre on May 31 and June 1 as part of the San Francisco International Arts Festival.